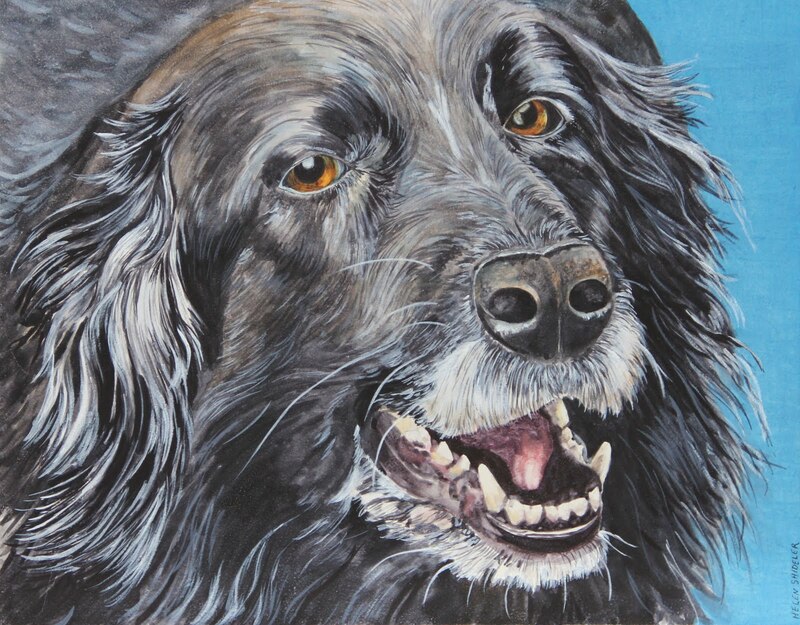 This is a painting of our doggie. Sadie is a highly spirited border collie lab cross and is always looking for someone to play with or for someone to pay attention to her. She is very expressive and communicates with us quite clearly – Almost always about attention and/or food or food and/or attention! She is getting on in years now. We think she is about eleven – not sure as she was a resuce dog. Her hair is turning quite white and she has started to slow down some. This is a mixed watermedia painting on Ampersand Aquabord. This surface is wonderful for painting textures such as fur and hair. Stormy Sunday and what shall I do. Sounds like the perfect day to lock myself in my studio and paint away. This is a mixed watermedia piece on Ampersand Aquabord of our dog Sadie. She is so inquisitive. Either looking for trouble or looking for food. I could not resist painting her. This was c ompleted in about five hours – the background gave me trouble. You cannot be in a hurry with this painting surface. 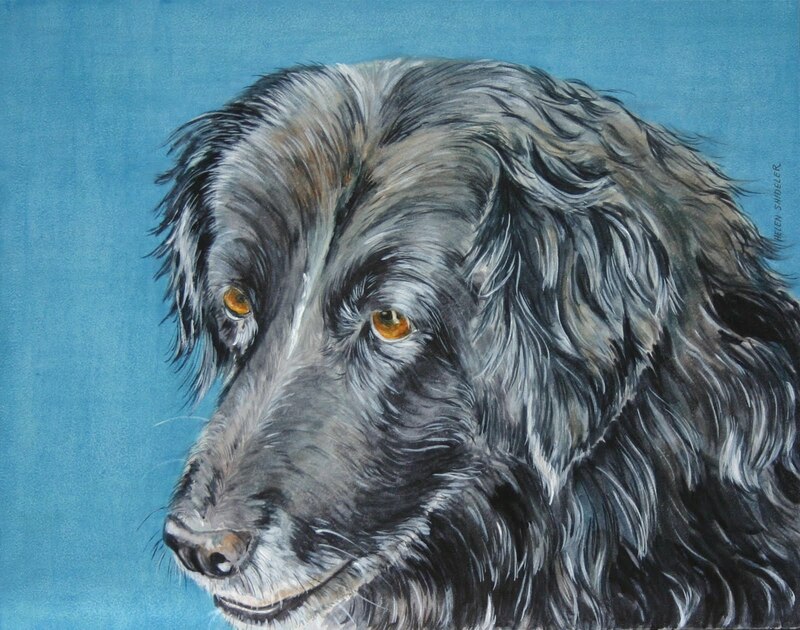 Sadie is a mixed breed – cross between a lab and a border collie – the border collie being dominent. She has us completely trained! This painting was an experiment with some of the new tools available for watercolors. I admit I am a watercolor purist – and so this was also an exercise in bravery. I purchased a number of clayboard panels while visiting my daughter in Vancouver last year. It has taken me exactly a year to decide to experiment with them. The texture of the clayboard is quite different from paper – at first I was unsure if I liked it or not. After painting for a few minute – i started to get the feel for the material – bottom line. If you have time to play, this is a fun product. I sealed the finished painting with three coats of Krylon spray varnish. I have not decided yet if I am going to apply Golden Polymer Varnish over top or not. 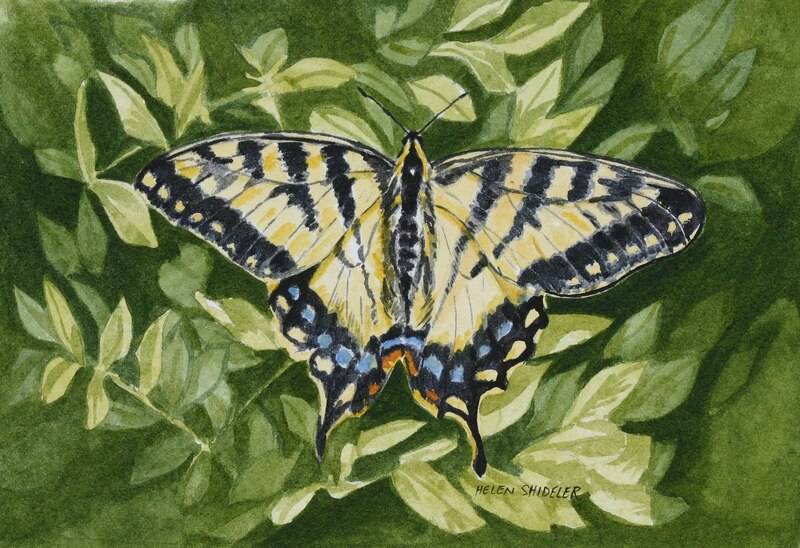 I know it will owrk well as I used it on teh Eastern Tiger Swallowtail in my last blog. 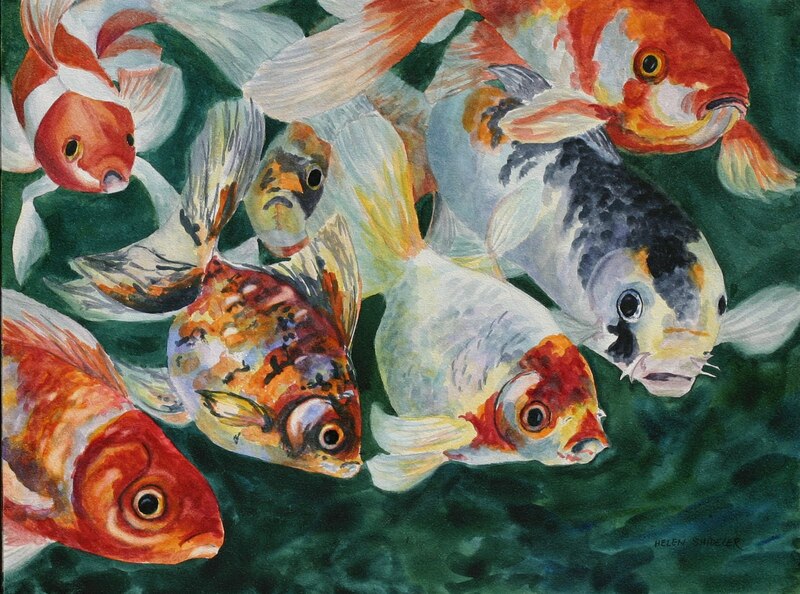 These goldfish and Koi are family pets – they summer in our pond and winter in a large aquarium in our basement. This beauty was a frequent visitor to our Siberian Pea Shrub earlier this summer. I could not resist painting it – after chasing it around with my long lens to “capture” an image. I completed this work to experiment with sealing and varnishing a watercolor on paper in order to frame without using glass. I have to admit, I purchased the recommended products and am nervous to use them.